The 2010 Hot Springs National Park Quarter Two-Roll Set contains a total of eighty coins featuring the first ever strike of the new America the Beautiful Quarters Program. Forty of the coins in the set are struck to circulation quality at the Mint’s facility in Denver and forty are struck at the Mint’s facility in Philadelphia. The America the Beautiful Quarters Program debuted in 2010 with this strike. By the time the program has run its course, a total of fifty-six new quarter dollars will have been issued during the eleven year series. The reverse of each of these strikes features a design emblematic of a selected site of national interest in the United States or one of its territories. The release order of the coins in the series is dictated by the order in which the honored site came under the direct control of the federal government. This set marks the first ever strikes of the new America the Beautiful Quarters Program. The highlighted site is Hot Springs National Park which is featured on the reverse of each strike with an emblematic image of the park. 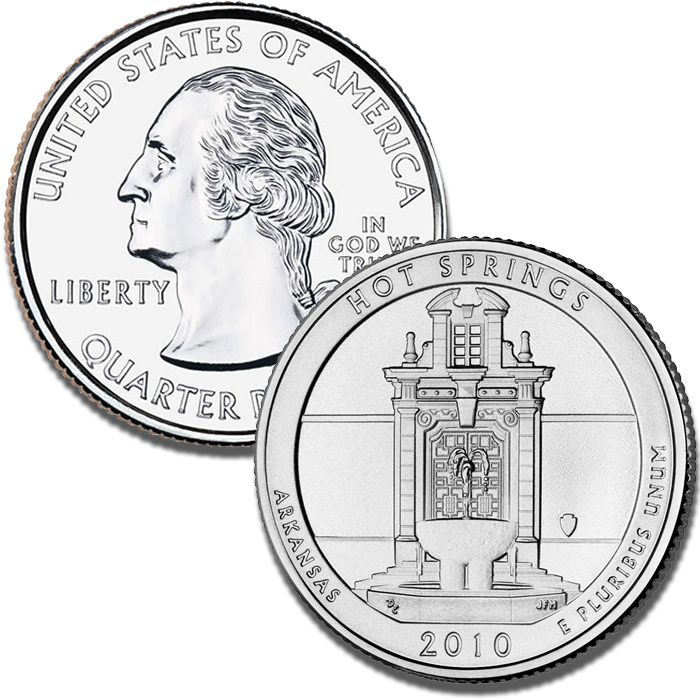 April 19, 2010 was the release date of the Hot Springs National Park Quarter Two-Roll Set from the US Mint. The US Mint issued the two-roll set at a price of $32.95 per set. Each rolls contains 40 coins, with one roll consisting of circulation quality strikes from the US Mint facility in Denver and one roll from the US Mint facility in Philadelphia. The obverse (heads side) portrait of George Washington was completed by John Flanagan. His original 1932 work was slightly modified by William Cousins for the 50-State Quarters Program and was used again on the America the Beautiful Quarters. The reverse (tails side) image emblematic of Hot Springs National Park shows the park headquarters building with one of the thermal fountains out in front. The design was done by Don Everhart.